Pivotal Health Solutions warrants to the original purchaser that each Athletic EdgeTM product shall be free from defects in material and workmanship and agrees to remedy any such defect or to furnish a new or equal part in exchange therefore. Warranty covers the components listed below and repairs for the first year, commencing on date of original shipment. Labor coverage may not include replacement or installation of small parts or components. Pivotal Health Solutions Service and/or Sales will determine the technical level of service needed and approve labor coverage on a case by case basis. Pivotal Health Solutions reserves the right to inspect claimed defective products. No returns, replacements or repairs may be made without prior written consent. Please do not return any product to Pivotal Health Solutions without first contacting Customer Service for a Return Authorization number. Products returned without a Return Authorization number will be refused back to the customer at their expense. This Warranty covers defects in materials and workmanship provided the product is used for the normal purpose for which intended. The customer shall be responsible for the proper set-up and use of the product. This Warranty does not include damage resulting from accident and expressly excludes normal wearing of parts or deterioration due to normal wear and tear, damage caused by improper set-up or storage, defect caused by transportation, accident, fire, flood, alteration, abuse, misuse, or negligence. Pivotal Health Solutions shall not be liable for any direct or indirect, incidental, exemplary, or consequential damages or delay, including damages for loss of income or loss of use. failure to provide normal maintenance for the Products or any component thereof in accordance with the Product Operating Manual. alteration or obliteration of any identifying marks. Note: Warranty periods listed below apply only to products purchased in new condition. Any product sold as a factory blemish or in used condition are sold ‘as-is’ and are limited to a (1) year warranty on the frame only, commencing on date of delivery. Includes: Aluma Elite Taping Stations/Tables, Aluma Elite Treatment Tables; Aluma Elite Modality Carts; Aluma Elite Athletic Lockers; Aluma Elite Mat Tables; Aluma Elite Portable Workstation; Aluma Elite Whirlpool Tables; Smart Carts; Wood Treatment Tables; Mat Platform Tables; Leg and Shoulder Therapy Tables (LAST Series); Hi-Lo Treatment Tables; Portable Treatment Tables; Storage Treatment Cabinets (CAB Series); Treatment and Recovery Cabinets (CAB Series); Modality Treatment Cabinets (CAB Series); Convertible Taping Cabinets (CAB Series); Electric Treatment Cabinets; Electric Taping Stations (MT series); H-Brace Taping Tables; Center Storage Modules, Individual/2-Seat/3-Seat/4-Seat Taping Stations; Lockers (Athletic, Club, Storage and Corridor); Stor-EdgeTM Modality Carts; Stor-EdgeTM Multi-Purpose Carts; Stor-EdgeTM Medical Cabinets; Stor-EdgeTM Stationary Cabinets. *All Accessory Warranties are parts only. Labor not included. Warranty service must be obtained through either Pivotal Health Solutions or an authorized dealer in the PHS product line for which warranty service is requested. To expedite the process include the invoice number and/or product serial number in your request. • For day to day cleaning, a solution of 10% mild household liquid dish soap with warm water, applied with soft damp cloth. Rinse with clean water and dry. • For stains, dampen a soft white cloth in a one to one (1:1) solution of Fantastik® and water OR Formula 409® and water. Rub gently and rinse with a water dampened cloth. • For more difficult stains, dampen a soft white cloth with a solution of household bleach (10% bleach / 90% water). Rub gently and rinse with a water dampened cloth to remove bleach concentration. There is a disinfecting wipe on the market called Protex Ultra Disinfectant Wipes. Many of our customers use these. WHAT NOT TO USE: Using the wrong cleaning agents you can void your warranty and crack, dry out and destroy your vinyl. Do not use any cleaning agents that contain alcohol, harsh chemicals or abrasives. Doing so will void your warranty! When in doubt, give us a call! 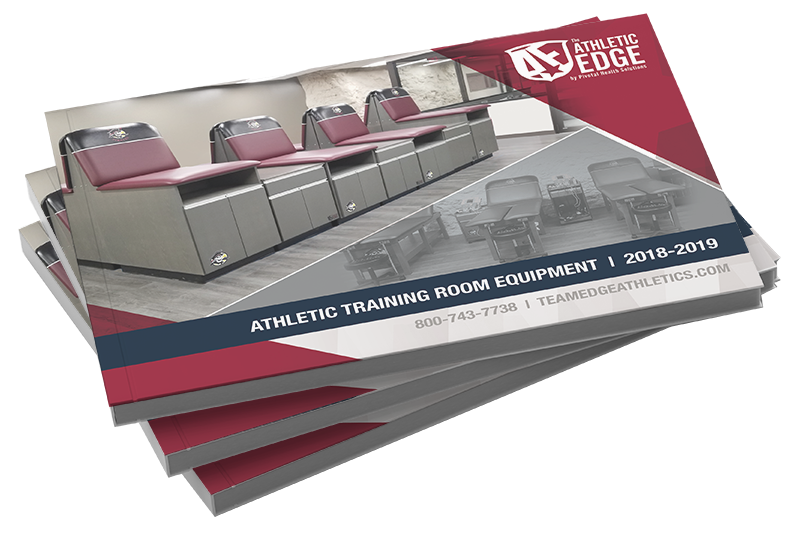 A comprehensive guide to our lines of custom branded team rooms, lockers, treatment tables, and accessories, along with therapeutic devices for pain relief, healing and maximum performance.